Grit is having both the passion and the perseverance to achieve a goal, and grit often predicts who achieves the highest levels of success in school and at work. Tell me about a long-term goal you're currently working on. Maybe you've started a business and you're in the process of growing it. Maybe you want to lose 20 pounds. Maybe you're climbing the corporate ladder. Maybe you want to keep your relationship strong for years to come. Succeeding at that goal is going to involve a lot of hard work and maybe some smarts, but it's also going to involve grit. 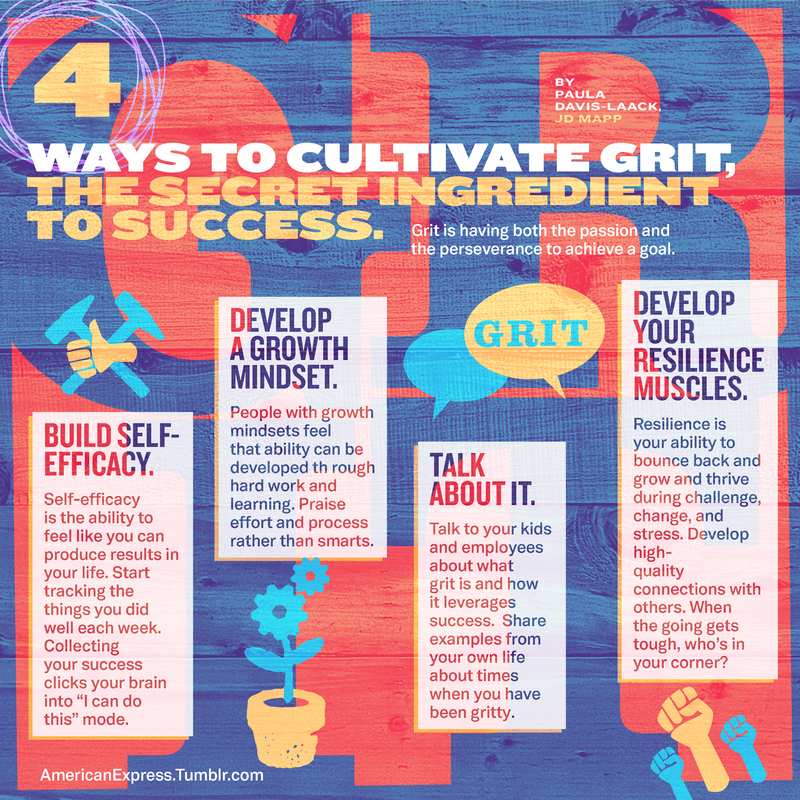 Grit is having both the passion and the perseverance to achieve a goal, and grit often predicts who achieves the highest levels of success in school and at work. Gritty students outperformed their less gritty peers, and grit scores are associated with higher GPA's (Duckworth et al., 2007). In one study, grit was a more accurate predictor of whether an incoming cadet would finish his or her first summer of basic training at West Point; more so, in fact, than self-control, academic GPA, Military Performance Score, and West Point's own Whole Candidate Score, (Duckworth et al., 2007). Grit also predicted those students who would advance into the later rounds of the Scripps National Spelling Bee (Duckworth et al., 2007). More recently, grit has been shown to predict the success of women lawyers in the country's largest law firms (Hogan, 2013). This is a big finding in the legal profession because for years, men and women have been entering law schools and law firms as first year associates in roughly equal numbers, yet the number of women making it to the highest levels of partnership has remained static - and really low. As of 2013, the number of female equity partners was about 17 percent. What's also troubling is that the percentages of women equity partners and women associates in the typical law firm have actually declined slightly in the past two years (Scharf, Liebenberg, & Amalfe, 2014). Encouraged by Hogan's research, the American Bar Association Commission on Women in the Profession created the Grit Project to educate women lawyers about the science behind grit. Build self-efficacy. Self-efficacy is the ability to feel like you can produce results in your life. Is the effort you're putting toward something actually paying off? Do you have the confidence you need to reach your goals? One way to build self-efficacy is by mastering tasks and experiencing success. Big successes are great, but self-efficacy is also built through experiencing frequent small successes. Start tracking the things you did well each week. Did you lose another pound? Right that down. Did you start writing the first chapter in your new book? Right it down! Collecting your success clicks your brain into "I can do this" mode. Develop a growth mindset. People with growth mindsets think that ability can be developed through hard work and learning, and see failure as an inevitable result of trying new things. As a result, people with a growth mindset try new challenges, take good risks, and use effort as a path to mastering something. One easy way to start building a growth mindset is to ask for feedback when something doesn't go your way. Understanding what tripped you up will help you move in a better direction on your path to goal achievement (Dweck, 2006). Talk about grit. Talk to your kids and employees about what grit is and how it leverages success. Share examples from your own life about times when you have been gritty. Emphasize that failure is going to happen during pursuit of tough, long-term goals and discuss what Plan B (or even Plan C) looks like. Develop your resilience muscles. Resilience is your ability to bounce back and grow and thrive during challenge, change, and stress. You are going to experience lots of obstacles if you're pursuing a long-term, challenging goal, and you have to be able to bounce back from setback. An easy way to build your resilience is to develop high-quality connections with others. When the going gets tough, who's in your corner? The recipe for success is about much more than smarts and talent. Grit is a powerful trait to cultivate in those you lead and teach and is worth focusing on as early as possible in your career. Paula Davis-Laack, JD, MAPP, is the Founder and CEO of the Davis Laack Stress & Resilience Institute, a practice devoted to helping busy professionals prevent burnout and build resilience. Paula is the author of the e-book, 10 Things Happy People Do Differently. Her website is www.pauladavislaack.com. Dweck, C. (2006). Mindset. New York: Ballantine Books. Hogan, M.L. (2013). Non-cognitive traits that impact female success in big law. Unpublished doctoral dissertation, University of Pennsylvania. Scharf, S.A., Liebenberg, R., & Amalfe, C. (Feburary, 2014). Report of the Eighth Annual NAWL National Survey on the Retention and Promotion of Women in Law Firms.